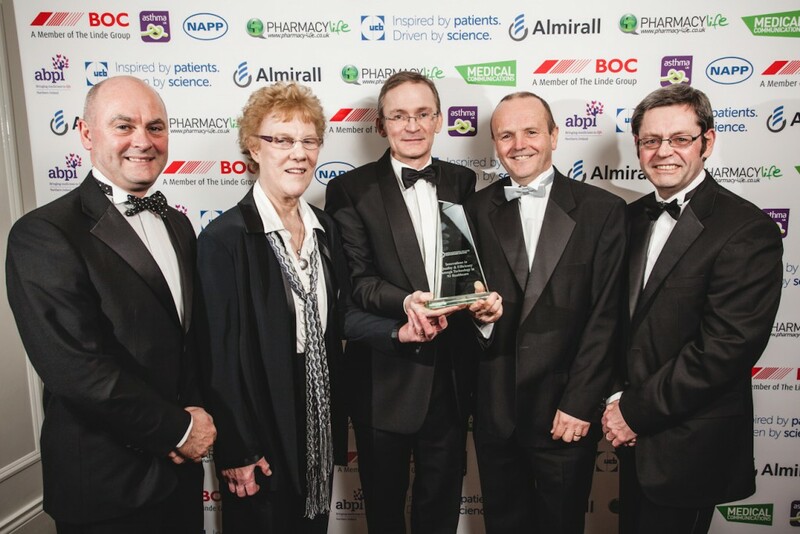 Antrim Area Hospital’s Pharmacy and Medicines Management Centre was successful with two projects in the recent 16th Northern Ireland Health Care Awards. LAMPS (Live Automated Microbiology Pharmacy Surveillance System), its software-based surveillance system for monitoring antimicrobial resistance, won in the award category ‘Innovations in quality and efficiency through technology’, whilst WriteMed, an electronic Medicines Reconciliation software system received a commendation. The Annual Report of the UK Chief Medical Officer (2011), states that antimicrobial resistance is the most serious threat facing modern healthcare and costs the NHS at least £1 billion per year. LAMPS counters this threat by providing automatic computer-based surveillance of antimicrobial resistance and full antimicrobial stewardship features. By facilitating more appropriate prescribing and promoting improved adherence to antimicrobial policy LAMPS helps to limit the spread of antimicrobial resistance. The system provides a Trust-wide strategic management summary of infection-related information for a population of 475,000 (from a catchment area of 1,733 square miles in 7 hospitals). A comprehensive suite of analysis and reporting features allows LAMPS to produce in seconds, reports that previously would have taken weeks to produce. WriteMed addresses the lack of communication that can occur when patients move between home and hospital. This can be the cause of medication errors and adverse drug events in hospital. WriteMed is used to create a complete, accurate, list of medications for every patient, seen by the pharmacy team, when they are admitted to hospital. All changes to the patient’s medications, made during the hospital stay, are recorded in WriteMed and this information can be sent electronically to the patient’s GP at the time of discharge. LAMPS and WriteMed are both “live” and in daily use across the whole of the Northern Health and Social Care (HSC) Trust. Both systems interface directly with the Patient Administration System, the dm+d (NHS Dictionary of Medicines and Devices) and the laboratory systems and are compatible with HSC computer systems across Northern Ireland. Both software applications are designed to be compatible with NHS computer systems UK-wide. Dr Brownlee also encourages HSC staff with innovative ideas to improve patient care to contact HSC Innovations for further assistance and support in developing these ideas into products that will ultimately benefit patients. These products were developed in conjunction with Yarra Software, a local software development company. Further information on the products is available from Yarra Software.